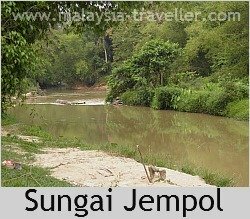 Jalan Penarikan, also known as the Penarikan Portage (or porterage) is the name given to a location at Jempol, near Bahau in the state of Negeri Sembilan, where the Sungai Serting and the Sungai Jempol flow within a few hundred metres of each other. 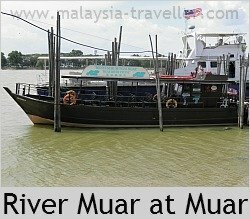 The Jempol River joins the Muar River which makes its way westwards until it flows into the Straits of Malacca at the town of Muar. The Serting on the other hand runs into the Bera and then into the Pahang River which flows eastwards into the South China Sea at the town of Pekan. Malay traders have for centuries known that these rivers could be used as a short-cut across the Malay Peninsula. All that was needed was to drag their boats overland for the short distance between the two rivers. It is this dragging which is the source of the name Penarikan, the Malay word for 'pulling'. As early as the 13th century, the armies of the Thai King were said to have used the Penarikan Portage route in their operations against the Sultan of Johor. The Thais even tried to build a canal to link the two rivers and the tombstone of a Thai commander was discovered at Jempol bearing the date 1265AD. In the 14th century, Arab merchants looking to trade and spread Islam among the Malays, were keen to avoid the arduous journey around the southern tip of the peninsula and the pirate-infested waters of the Straits of Johor. They were introduced to the inland waterway shortcut to the east coast. The legendary Hang Tuah was said to have used this route when he fled with Tun Teja to Pahang in the 15th century. Similarly, the last Sultan of Malacca used the rivers to escape the Portuguese. In 1613, a Portuguese named Godinho de Eredia drew one of the first maps of the crossing and claimed to have made the journey from Muar to Pekan by boat in 6 days. That seems unlikely. I have calculated the distance (with help from Google Maps) at around 540km which means he would have had to cover around 90 km per day which would be hard going in a man-powered (or sail?) boat. 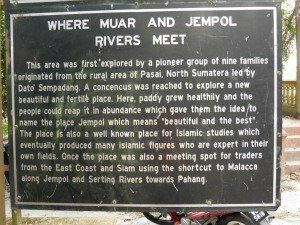 In 1827, a British traveller called Charles Gray wrote about a journey from Jempol to Malacca via the River Muar in 8 days which seems more likely as it was only half of the full journey and he was travelling with the current. In 1865, another British official, Daly, left a full account of his trans-peninsular trip via the Penarikan in a 'prahu' taking 10 days of provisions including rice, tea, tin sardines, and ammunition for hunting pigeons. When his party reached the Penarikan Portage, they paid 14 men ten cents each to drag the boat the quarter mile distance from one river to the next. It took two hours of effort. Now that roads and aircraft criss-cross the peninsula with ease, the old inland waterway route has fallen into disuse but I believe in modern times there has been the occasional research expedition studying the economic potential of developing this inward waterway link. As far as I know the rivers are still navigable for small craft so if you fancy an extreme canoe or kayak trip, take a look at this map which I plotted on Google Maps. Please zoom in and look closely because it took me about two hours to trace the route. How long would it take to travel the entire route by canoe? The journey is 540km long which is a very, very long way in a canoe. If you could manage an average paddling speed of 5.5km per hour for 8 hours per day we are talking about a trip of over 12 days. Probably better to use a boat with a motor and only then with an experienced guide, plenty of careful planning, support and back-up. Hazards might include dangerous currents, rapids, hidden underwater objects, high water, toxic effluents, sunstroke, lightning, crocodiles, mosquitoes and dehydration. Only for the insane!